Friday's jobs report eased some recession fears, but many are still searching for cracks. 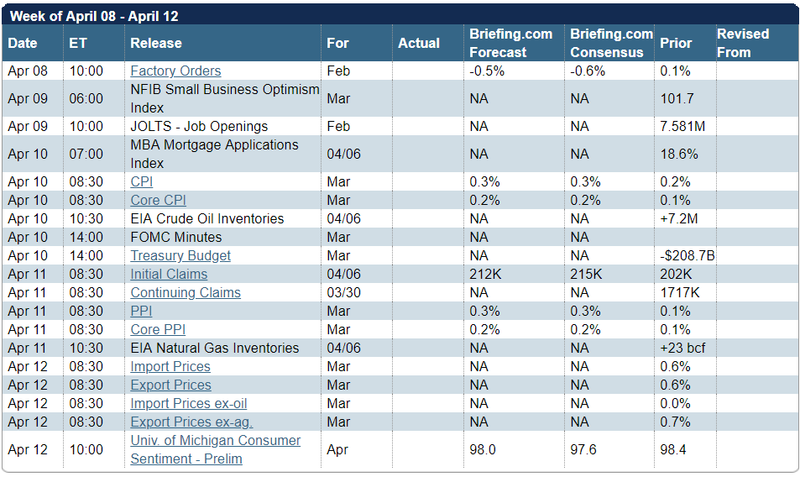 The calendar is normal, emphasizing inflation and sentiment. Pundits can continue the bull/bear debate -- currently centered on when the aging bull will die. Barron's cover story will keep the topic alive. The verdict on the economy is pretty easy if you look at the evidence. There are reliable warning signals, but only for the next year. At present, recession odds are low. In the absence of a credible recession signal, the bull market can continue. Are we near the end of the economic cycle? In my last full installment of WTWA I asked whether the Fed would hint at a new course. Impressions from the meeting were mixed. It has remained a prime topic of conversation fueled by Presidential tweets, comments, and potential Fed appointees. In my “vacation edition” I summarized the most important aspect of the Fed meeting as well as the unusual reaction of the markets. I promised that I would write something if an important issue arose. The questionable analyses of the yield curve fit the bill. I followed up with Making Sense of the Fed and a deeper look at how interest rate arbitrage is flattening the yield curve. I also sent the Fed piece to clients. Later in the week Goldman Sachs offered similar observations. It is easy to get caught up in hasty reactions to economic news when a complete analysis is required. I always start my personal review of the week by looking at a great chart. This week I am featuring Jill Mislinski’s data-packed version. Stocks gained 2.1% on the week. Because of a gap opening on Monday, and a close near the week’s high, the trading range was only 1.5%. You can see volatility comparisons in our Quant Corner. Let’s also review the December drawdown. Jill’s chart provides both a long-term perspective and context for the Q1 rebound. 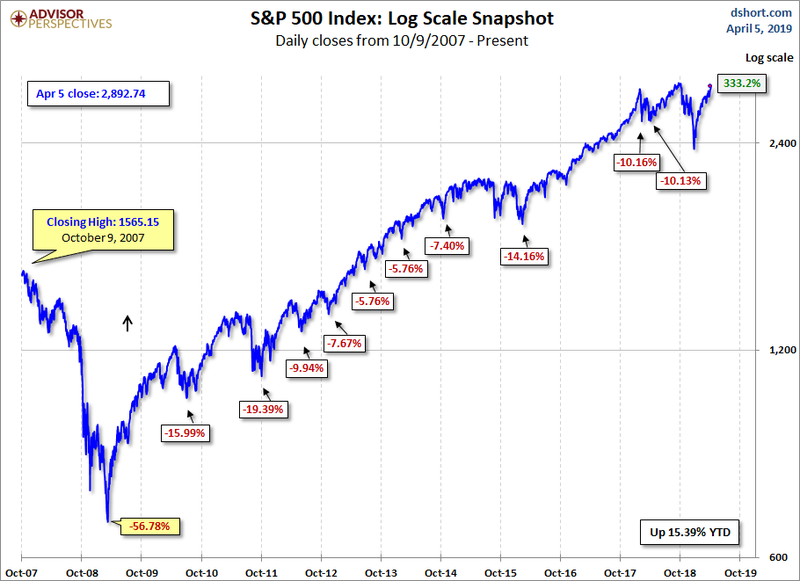 Only the October, 2011 pullback was in the same range. I enjoyed the Visual Capitalist’s presentation of technology hype cycles. New Deal Democrat’s high frequency indicators are an important part of our regular research. Long-term indicators have retreated to neutral, as did the nowcast. Short-term indicators are negative. He expects further deceleration this year. Construction spending for February increased 1.0% versus expectations for a decline of -0.3%. The ISM manufacturing index increased to 55.3, beating expectations of 54.1 and February’s 54.2. 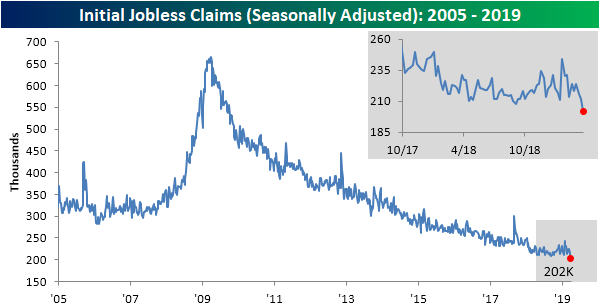 Initial jobless claims were only 202K, beating expectations of 217K. Bespoke observes that this is the low point for the cycle, but prior low prints were later revised upward. Their chart is a nice combination of long-term perspective and a closer look at the last two years. Today’s update serves as a reminder that relying on one data point to evaluate business-cycle risk usually delivers misleading results in the extreme. 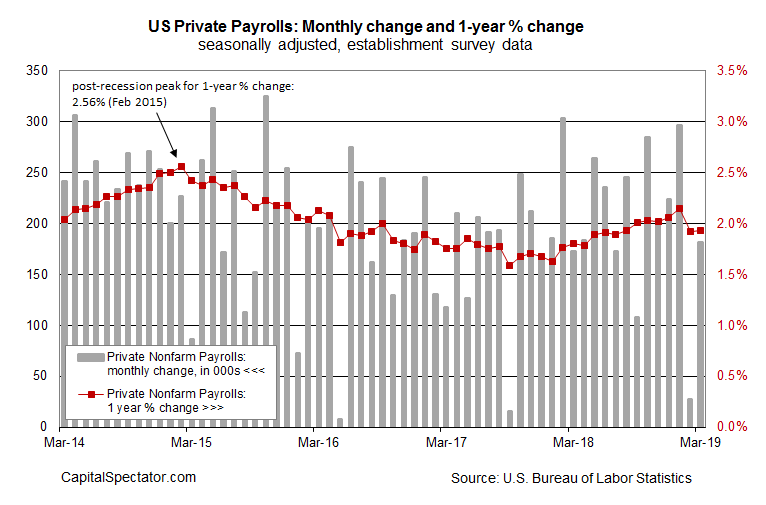 But even if you were inclined to use the disappointing February jobs report as a guide, focusing on the more reliable one-year change still suggested that the economy was expanding at a decent if slower pace. Retail sales for February declined -0.2% after a prior gain of 0.7% (revised from 0.2%) and expectations of a gain of 0.2%. ISM non-manufacturing for March registered 56.1, missing expectations of 57.9 and the prior reading of 59.7. You can get some additional color by reading the comments at the ISM site. Durable goods orders for February declined -1.6%. E -0.9% and P 0.1% (revised lower from 0.4%). Ex-transportation the miss was only 0.1% versus expectations of 0.2%. ADP private employment showed a March gain of 129K, missing expectations of 178K and a prior of 197K. Little progress on China trade issues, but talks will continue. (MarketWatch). Drug-resistant germs. And the secrecy surrounding the incidents. Have you heard of Candida auris? (NYT). 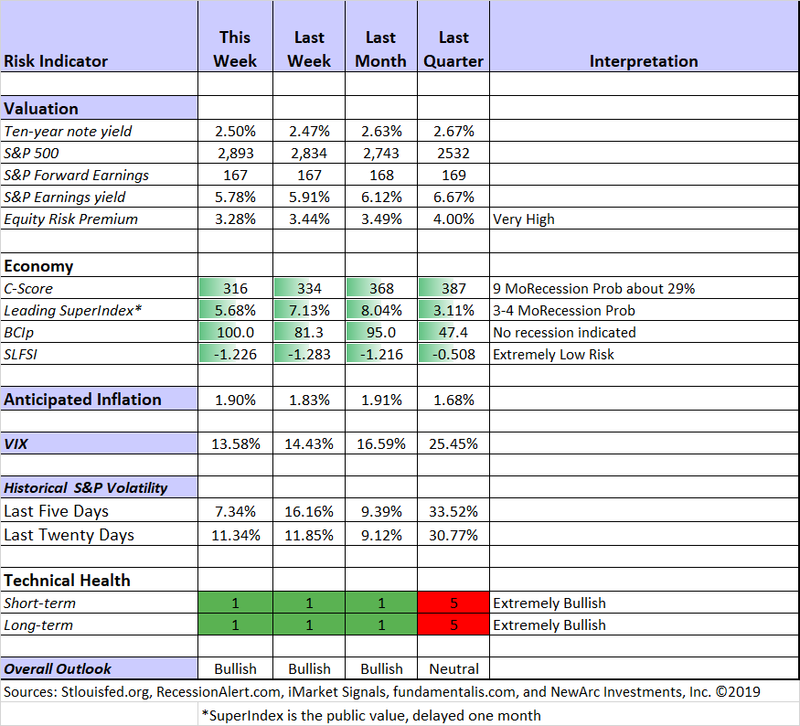 We have a normal economic calendar with the highlight on inflation and confidence surveys, but none of the big economic indicators. Some will scrutinize the FOMC minutes, trying to find new information. 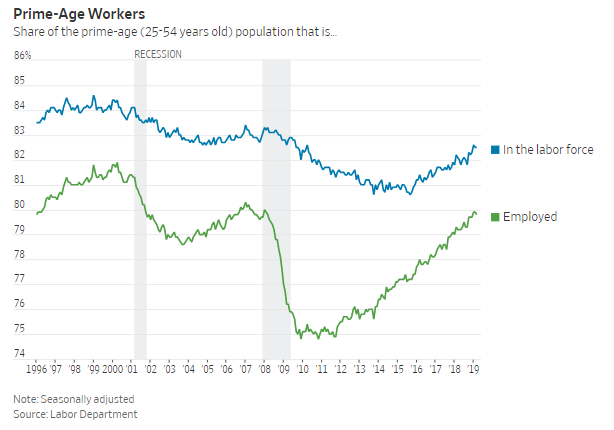 Data wonks will prefer the widely-misunderstood JOLTS report, which is the best indicator on labor market structure, but provides nothing fresh on job growth. And of course, stay tuned for anything new on the DC soap opera, which so far has had little market effect. Is the end near for this business cycle? Bob Pisani, who does an excellent job of summarizing current trader viewpoints, highlights the economic debate as the key bull/bear distinction. While business cycle analysts have been following this continuously, we now see many more joining the discussion. The most popular viewpoint begins with the “aging bull” thesis. People are conditioned to make historical comparisons without much analysis of the comparability. This has helped to drive many average investors in a search for yield, believing that this is less dangerous than finding cheap stocks. The result is a crowded trade in utilities and so-called “defensive” names. I Googled Barron’s + aging bull and got a long list of stories over seven years or so. Other sources had similar results. Many continue to expect a recession, just moving the date by a year or so when it does not happen. John Mauldin’s recession series, which includes the usual long list of things someone might worry about. In the CNBC video he makes an excellent distinction between economic results and the market in the short term. Typically, the economy trudges along a straight path for years at a time and it's the stock market that is easily excitable, ripping to and fro based on the latest information to hit the tape. Over longer periods of time, we do see a correlation between stocks and the economy, but over periods of less than a year, there is literally no rhyme or reason for what has happened. All explanations are simply ex post facto; an expert grasping at straws to assemble a reasonable take on what has occurred, and why it ought to have been obvious to everyone. Well put! But then we get the investment advice, which seems inconsistent with the reasoning – at least for the long-term investor. “Hardly any economic indicators show that there will be a recession,” Andersen says. The article continues with analysis from three prominent strategists, who cite favorable Fed policy as a key tailwind and a tighter labor market as a concern. One has an interesting theory about mini-cycles within the bull market run, throwing off the traditional timing. And of course, resolving the trade dispute with China is important. Understanding these issues is the single largest challenge for the individual investor. I’ll offer my own conclusions in today’s Final Thought. Short-term and long-term technical conditions continue at the most favorable level. Our fundamental indicators have remained bullish throughout the December decline and rebound. The C-Score reflects the flattend yield curve. I am watching this closely, including analyzing signs of possible confirmation. Georg Vrba: Business cycle indicator and market timing tools. Neither Georg’s business cycle index nor his unemployment rate indicator signal a near-term recession. Doug Short and Jill Mislinski: Regular updating of an array of indicators. Great charts and analysis. With Friday’s employment data, it is time for an update of the Big Four, the indicators most important for recession dating. 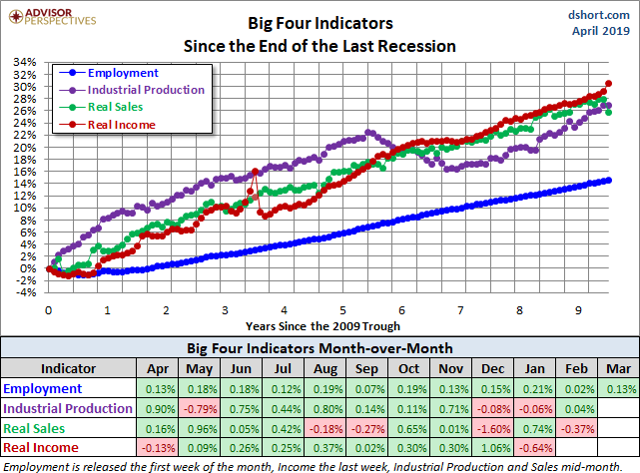 A recession is marked by a significant decline in these indicators, not a just a slowing of growth. Sales and income will be especially interesting to watch. The quarterly JP Morgan guide to the markets is out. As always, it is packed with important data and charts. More to come from this source. Brian Gilmartin provides an interest analysis of upcoming earnings. He accurately predicted the distortion of the normal pattern of revisions thanks to the Tax Cuts and Jobs Act. He expected a decay in forward estimates until the quarter started. He highlights they key sectors while pondering whether Q1 will represent a bottom. Check out our weekly “Stock Exchange.” We combine links to important posts about trading, themes of current interest, and ideas from our trading models. Last week we asked fellow traders about their risk per trade. As usual, we discussed some recent picks from our trading models. Felix rated the top twenty stocks in the Russell 1000 and Oscar did the same for the most liquid ETFs. Pulling this altogether was our regular editor, Blue Harbinger. Business TV presents additional dangers to your rationality: It reprograms you to think about the stock market as a game. In encouraging you to play that game, it puts you at risk of nullifying all the research you’ve done, as you let your time horizon dwindle from years to minutes. 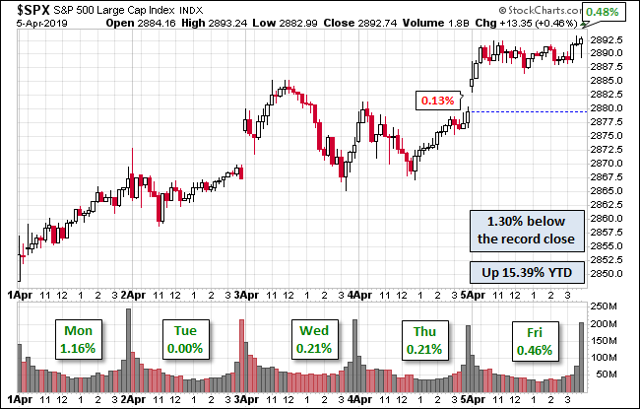 Chuck Carnevale continues his sector-by-sector search for bargains. This is Part 13. Chuck is especially tough on the stocks in the Non-Energy Minerals Sector. He is unhappy with the lack of consistency of returns and dividends. Reviewing his methods and how to apply them in this sector is important even if you don’t find an idea or two. Disney versus Netflix. Barron’s notes the strength in DIS before next week’s investor day and cites some recent upgrades. Lyn Alden Schwartzer takes a deeper look at the competitive strategies and valuations. Industrial stocks? Even if the economy slows? Barron’s interviews Barclay Analyst Julian Mitchell who illustrates the theme with a microcap idea. If you invest in microcaps you should stay small and diversify. Bhavneesh Sharma describes T2 Biosystems (TTOO), which has developed a rapid pathogen diagnostic testing process. Sepsis is the first market – and it is a big one. 30 undervalued stocks from Morningstar. There is a sector breakdown which readers might compare with some of Chuck Carnevale’s conclusions. Note also that utilities are trading at a 10% premium to their estimates. More detail on the sector is published here. Seeking Alpha Senior Editor Gil Weinreich’s Asset Allocation Daily is consistently both interesting and informative. Each week he highlights stories of interest for both advisors and investors. His consistent creativity highlights new angles and familiar problems. This week I especially appreciated his excellent discussion of absolute return. See the full discussion and links. Your needs do not always correspond to a benchmark. Gil also had a great post on How Safe Should Your Portfolio Be? Reading the two posts together is especially interesting. Since so many people are woefully prepared for retirement in terms of their assets, Social Security will be required to play an important role in retirement planning for a large number of the population. NAFTA 2.0 delays. I am cutting back on some related positions. My expectation is that the legislation may not emerge before Labor Day. These stocks are also threatened by the (possible, but unlikely) border shutdown. The process of replacing LIBOR continues. Most people either don’t know or have forgotten what this is and why it is important. Timothy Taylor has a good overview of the change and possible effects. Most financial commentary comes without any assurance about the presenter or the quality of the research. I love the CNBC box that shows “Street Cred.” It usually means that the speaker is one of thousands of employees at a big firm. After extensively reviewing many recession warning systems, I have one definite conclusion: None of them is useful beyond a period of a year. Predictions are especially unhelpful when they include a general warning based upon pop economics or confirmation of investor intuition. The ability to recognize real risk in the economy, financial markets, and corporate earnings is the single most important skill. You need not be a forecaster or market timer. You must get out of the way when the odds of danger are high. It will not be enough to own utilities or an “all-weather” portfolio. Risk recognition also permits you to be more aggressive when there is opportunity. No one knows how much longer this economic cycle or bull market might last. All we know now is that we probably have at least a year. I look forward to the remaining Josh Brown instalments, but I hope he will reconsider his ideas about the significance of the economy. He agrees that it matters in the long run. He recently interviewed Tony Dwyer, a “famed Wall Street strategist” and included his recession indicators. Dwyer’s methods are similar to those I have championed for almost nine years. It is no coincidence that we have both been comfortably bullish. So many investors are bamboozled by random and bogus explanations. They need clarity and accuracy from industry leaders. A credible recession warning should not be ignored. Nearly all major market declines are associated with recessions. If you include the SLFSI, reported here weekly, you have two excellent early warning methods. Brexit, although a significant extension seems likely. The Fed independence and policies. We may be surprised at the lack of impact from the suggested appointments. Even if appointed and approved, it is difficult for those without expertise to prevail in such an environment.